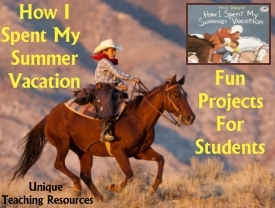 lesson plans, teaching resources, and a fun student project. 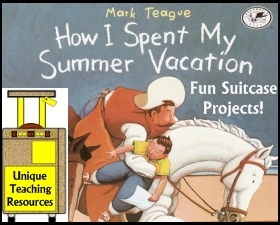 How I Spent My Summer Vacation, written and illustrated by Mark Teague, is a great book to read to your students at the beginning of the year to inspire them to write about their own summer holidays and to use their imaginations. 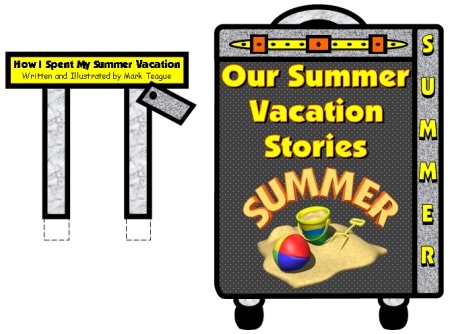 This story is about Wallace Bleff and his oral report on the classic topic: How I Spent My Summer Vacation. 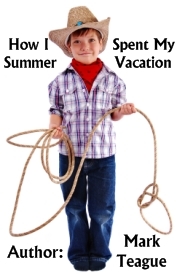 During his summer vacation, Wallace's parents send him out west to visit his Aunt Fern. Wallace's parents tell him, "Your imagination is getting too wild. It will do you some good to relax for a while." 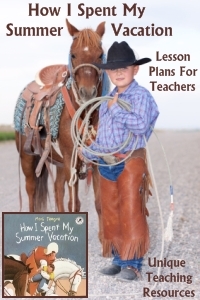 It won't take long for your students to realize that Wallace still has a wild imagination as he tells his class all about his adventures when he is captured by cowboys. This exaggerated summer tale is told through rhyming sentences and the art work is done in warm acrylics. specifically to go along with this delightful back to school picture book. 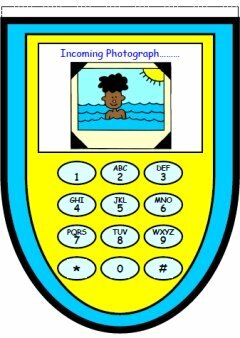 This five page banner is included for free in this set of back to school teaching resources. 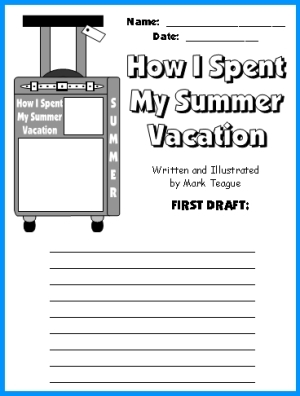 Since this book is about Wallace Bleff's "vacation," I have designed suitcase shaped writing templates for this back to school read aloud book. Most suitcases now a days are not carried. Instead, they have wheels on the bottom and you pull them using their handle. I have designed my suitcase templates in this fashion. I have not chosen a writing topic for this assignment because I wanted teachers to be able to use these templates for a variety of different writing ideas. 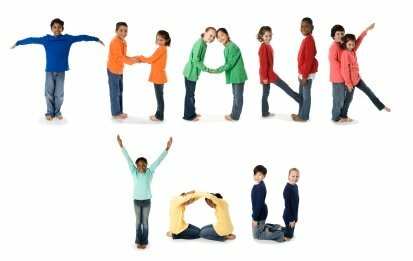 Since I am also a teacher, I understand that teachers often need to change or adapt a resource that we find to meet our own needs. I have provided 2 different versions of these suitcase templates in order to help you select the version that would best suit your own needs. 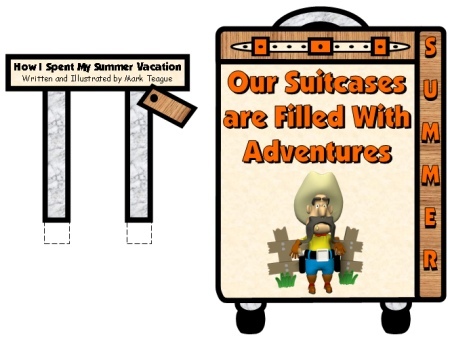 The first set of suitcase resources contains two templates: a handle and a suitcase. 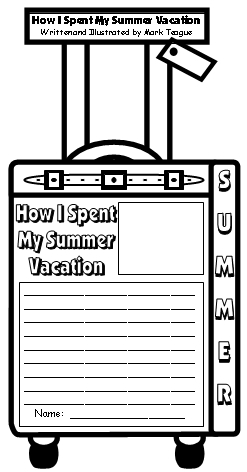 Below is an example of the first draft worksheet for the first suicase template. This assignment will not take your students very long to complete. 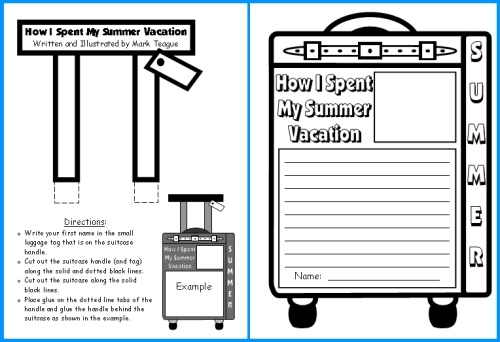 The suitcase templates are on 2 worksheets, have thick borders, and they are easy for your students to cut out and assemble together on their own. These suitcase templates measure 7 inches in width and 13 inches in height. 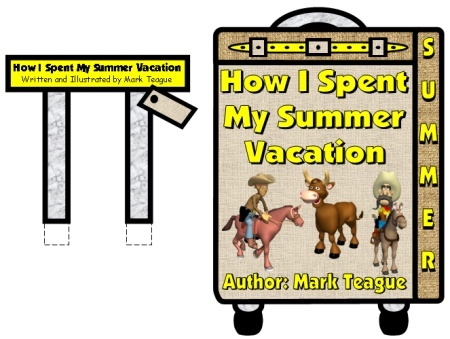 This creative writing assignment based on How I Spent My Summer Vacation by Mark Teague will provide you with student work samples that you can post on your bulletin board during the first week of school. 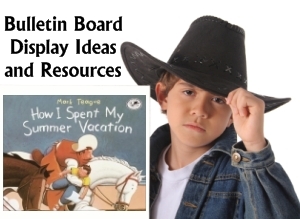 You can use the matching bulletin board banner and additional suitcase accent pieces that are included in this set of teaching resources to help you quickly assemble a colorful and eye catching bulletin board display during the first week of school. 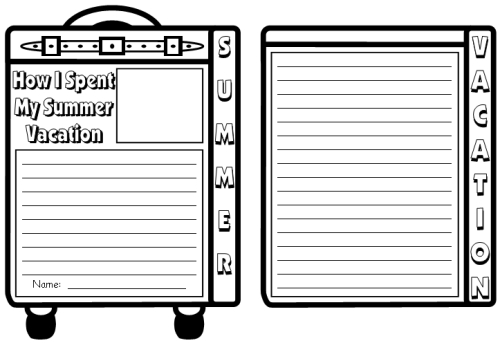 Below is an example of the first suitcase template. they glue them together to look like the example shown below. brown, blue, orange, green, red, pink, and purple. 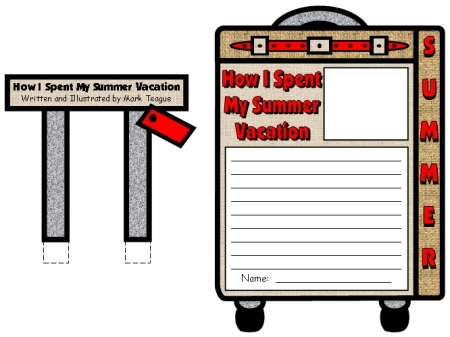 This set of teaching resources contains 3 templates and the two suitcase templates are stapled together at the top to make a flip book. The handle is glued behind this booklet. 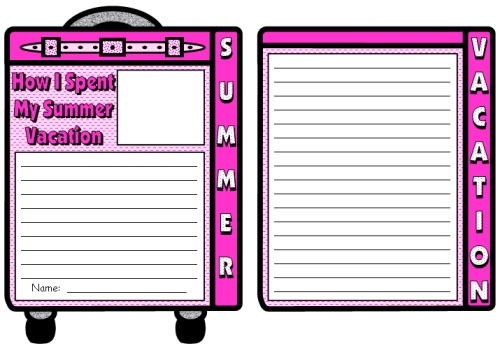 Below is an example of the first draft worksheets for the second set of suitcase teaching resources, which has space for students to write longer stories. The line spaces on the first draft worksheets match the line spaces on the final draft suitcase templates. The second set of suitcase templates contains 3 templates: handle, front of suitcase, and the back of the suitcase. After your students have cut out these 3 pieces, they should staple the two suitcase templates together along the top to form a flip book. The handle is glued on the back of the flip book. The handle template is not shown in the examples below, but it is the same size and shape as shown in the examples above. a flip book. The handle of the suitcase is not shown in this example to save space. I know that it takes teachers a lot of valuable time to assemble their classroom and hallway bulletin board displays. This time is valuable and better spent on developing your classroom curriculum, so I have designed a matching 5 page banner for your bulletin board display. 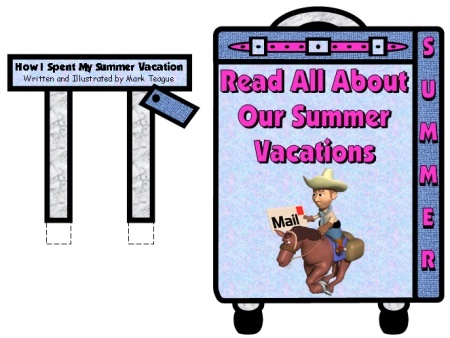 If you have access to a laminating machine, you can laminate this banner so that it is more durable and you can use it year after year for bulletin board displays of these How I Spent My Summer Vacation suitcase projects. 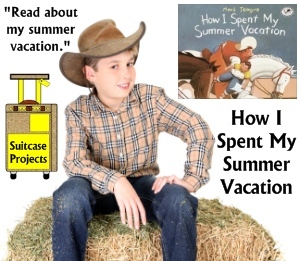 I have included 4 suitcase accent pieces in this set of teaching resources. 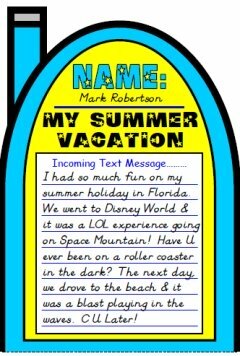 with these unique cell phone text message templates. 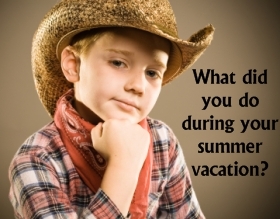 Thank you for visiting my How I Spent My Summer Vacation lesson plans page.